Italian rescue teams have abandoned their search for bodies inside the wrecked cruise ship Costa Concordia after conditions underwater deteriorated. “We have definitively stopped the underwater search inside the ship,” a spokesman for the fire brigade on Giglio island said. Fifteen people are still missing after the ship ran aground off Italy on 13 January with the loss of 17 lives. Work to recover the capsized vessel may take up to 10 months. Italy’s civil protection agency, which has been overseeing rescue efforts, said it had contacted the families of the missing, and the foreign embassies involved, to explain its decision. Emergency crews would continue to inspect the part of the ship that is above the water line and use specialist equipment to check whether there could be any corpses on the sea bed, it said. Divers have described tricky conditions inside the ship, with corridors cluttered with furniture and turbid waters. Dives has been limited to a maximum of 50 minutes, making it difficult to penetrate far into the vessel. Work to pump out more than 2,300 tons of fuel from the ship has been hampered by bad weather. The operation to move the ship itself cannot safely begin until the fuel is removed. The 114,500-ton Costa Concordia cruise ship ran aground on rocks with more than 4,200 people on board. Costa Concordia was holed by a rock after being steered by its captain to within 150 metres (yards) of the tiny island of Giglio. Captain Francesco Schettino is under house arrest in his home town of Meta di Sorrento, near Naples, while his actions are investigated. Francesco Schettino is accused of multiple manslaughter, causing a shipwreck, and abandoning ship before all passengers were evacuated. He denies the allegations. 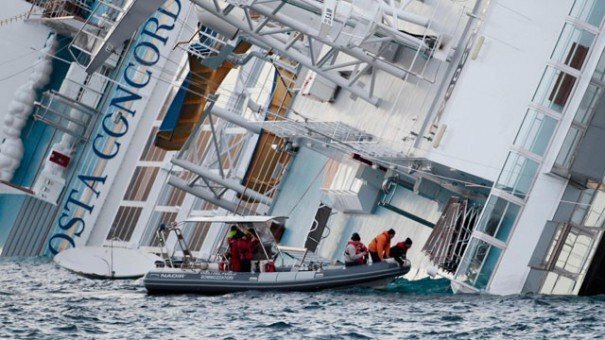 Costa Crociere, which is part of the world’s largest cruise ship operator Carnival Group, has offered uninjured passengers 11,000 euros ($14,500) each in compensation, on condition that they drop any legal action. However, a consumer group and two US law firms are filing a class-action lawsuit in the US, demanding at least $160,000 for each passenger on the ship.